Almost of the Hollywood celebrities have tattoos nowadays. Whether it’s permanent or temporary, they have it. These tattoos also catches the fan’s attentions every time they flaunt it on the public or post it on their social media accounts. There are tattoos which are nice to look at, yet there are those that can give you that unusual look. Below are a few of the Hollywood celebrities with the help Buzzfeed of who really needs some explanation why they decided to put that strange tattoos. Actually, almost of Miley’s tattoos look unusual. The “Wrecking Ball” singer has a sad kitty emoji on her lip, an anchor, a dreamcatcher, and others. However, there’s one tattoo that looks weird on her, although it has some emotional resonance and that is her Alaskan klee kai tattoo. Her dog passed away last April and she put a tattoo of it on her rib cage. The sensational and “Born This Way” pop singer admittedly said that she is obsess of unicorns. According to newnownext, Lady Gaga said that a unicorn is born magical and it is not the unicorn’s fault and it also does not make it any more or less special, yet it cannot help that it was born with magic. That unicorn tattoo also lead to her third studio album’s title. Pink is famous for her numerous tattoos and I love all of these except for her barcode tattoo. It display’s her lucky number which is 13, also her birthdate on September 8, 1979 and the release date of the album M!ssundazstood on November 20, 2001. 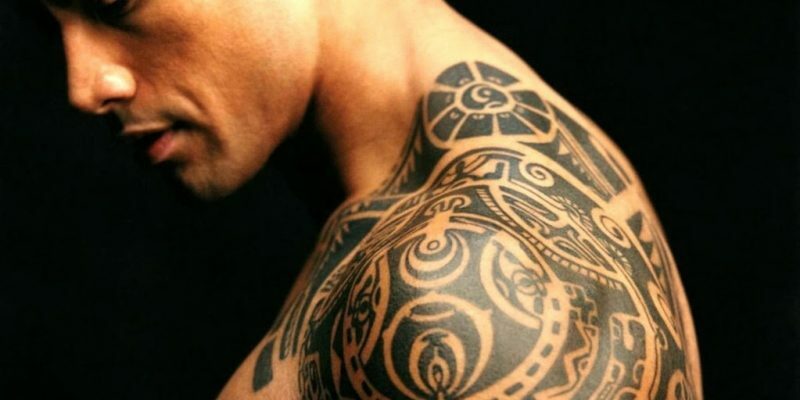 The half-Samoan famous wrestler traveled to Hawaii to get this tattoo design. He explained that it tells the story of what is important in his life as well as the strength, loyalty and protection to his family. The traditional tattoos usually cover from body to the waist until the knee. They are also incredibly painful and can take even months to complete. Although I know The Rock can handle it, yet i’m glad that he left some of his skin untouched. Supermodel Cara Delevingne has also many tattoos, yet the tattoo on her finger of a lion might just be her strangest choice. I know whatever tattoo she has on her body still looks good on her and still can walk the runway with confidence flaunting them all. Good thing that it’s on her finger and can’t be seen by many. I don’t know if he’s just lost again or trying to find his way back with his compass tattoo. Bieber’s tattoos all over his body already looks unusual yet many of his Belieber’s will still support him. He has been involved in many incidents and issues, but I hope that this compass can make him lead to a new path. Tattoo is an art. I love to see them on one’s skin, especially if the designs are really awesome. I saw cool temporary tattoo designs from TattooYou and it’s really nice if your tattoo is just temporary and not permanent because the latter can eventually ruin your skin.